Notes: Starter bolts and shims are included. 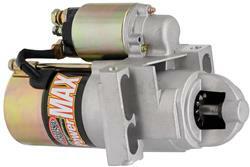 Works with EFI and carbureted engines. I am looking for a starter for my 1966 Chevelle so I need the R-terminal on the starter. The Motor is a 1982 Chevy 454 Big Block blk#14015445 1975-87 10.-1 compression 4-speed 168 flywheel with headers will this starter work ? Yes, very well! Much less weight to install in tight quarters. Not cheap, but good value received! I have a 427 small block chevy with 11-1 it works fine. It will work, probly have to shim it. I can tell you the one I bought has the R-terminal. As far as your application, I'm not sure. Mine works awesome with a 96 Vortec 350/4L60E though. Should work fine, I first ordered the summit mini starter for 65 Chevelle 454 but it hit the header, decided to give this one a try and suprised to see it looks like original but is quite a bit smaller, fit perfect with plenty of room and works great. this starter will work with a 70s chevy 454 engine? yes.I used this starter on a 1978 454 with a 168 tooth flywheel.Solved all my noisy starter problems. I installed this on a 1982 454 Chevy Big Block before my purchase I checked with Powermaster and Summit. The starter foot print is so much smaller the fit was perfect also know your flywheel size when calling. Excellent starter spins my 454 with 10-1 compression over with ease ! Will this work on a 153 tooth flex plate? yes, after a lot of trial an error with spacers. works great ! How many teeth are on the starter? Thank you for your question. The Powermaster 9200 start has a 9 tooth engagement gear. Very good starter ! Quiet ! the solenoid "clocking" it s different then the original thus attaching your ign wire is very tight unless you cut and expend it buy approx. 1-2"